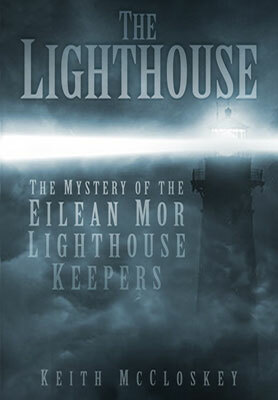 The Lighthouse outlines the story of three men (James Ducat, Donald Macarthur, and Thomas Marshall) who were stationed at the new Lighthouse on the windswept and storm lashed island of Eilean Mor out in the North Atlantic. 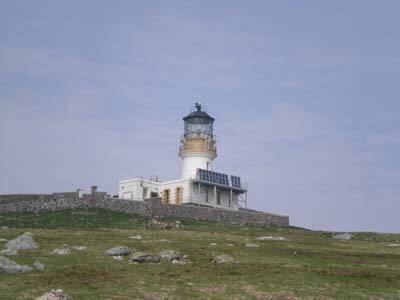 On 26 December 1900 the Northern Lighthouse Board tender Hesperus arrived at Eilean Mor with a relief Keeper and stores to replenish the station's supplies. After blasts on the ships horn and the firing of a signal rocket, nobody appeared from the Lighthouse to receive the tender. With no response, the relief Keeper Joseph Moore was put ashore and found the Lighthouse to be empty with no trace of the three men. They appeared to have vanished into thin air, with no trace of what may have happened to them. The mystery remains to this day. On December 20th 2015, I appeared on the Coast to Coast AM Radio Station in America. Coast to Coast AM airs on more than 560 stations in the US as well as Canada, Mexico and Guam and is heard by nearly three million weekly listeners. It is the most listened to overnight radio program in North America. Three lighthouse keepers mysteriously disappear from an island, and Russian police are handed a mummified baby that appears to be an alien. 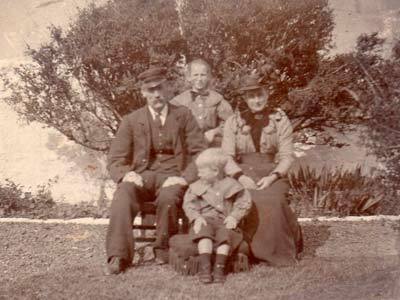 William Ross with his family. Ross should have been present on the Flannans when the men disappeared. His place had been taken by Donald Macarthur as he was on sick leave. One year and four months to the day after the tragedy William Ross dropped dead in the light room of the Eilean Glas lighthouse. 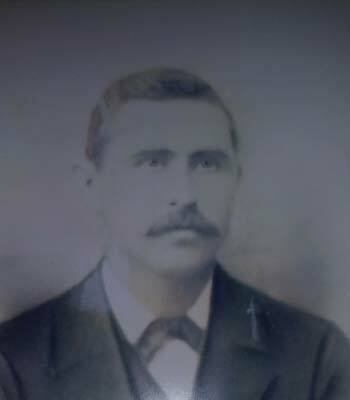 Joseph Moore was the first man on the island after the men disappeared and he was the first to find the keepers were missing. He had a strange feeling walking through the deserted lighthouse. He had a talisman which he had forgotten and he always felt that from that day that he set foot on the island his life was cursed due to the number of sudden and early deaths in his family. The interior of the Flannans lighthouse apart from the modern chairs is unchanged in the 1960s from the day the men disappeared. 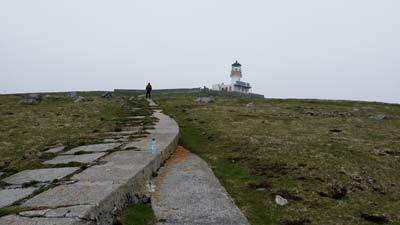 The Flannan Isles Lighthouse was known amongst the NLB Lightkeepers as "The Kennel" and was not a popular posting. 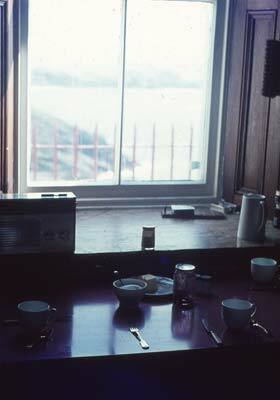 The interior of the Flannans Lighthouse looking out from the kitchen taken in the 1960s. 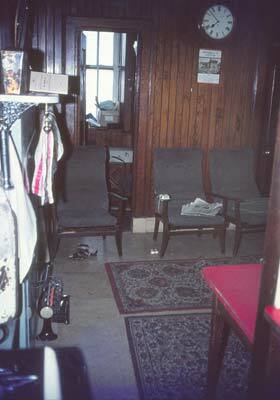 The area outside the winch room where the trolleys were kept. 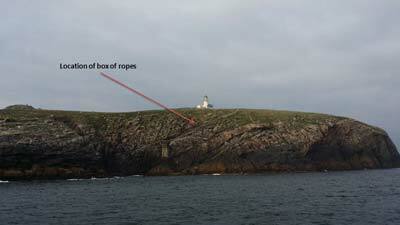 The location of the box of ropes at the West Landing. This picture shows how high the box was located above sea level. They were stored at that point as it was considered to be well out of harm's way. West Landing area. The square shape concrete block is where the crane was located. 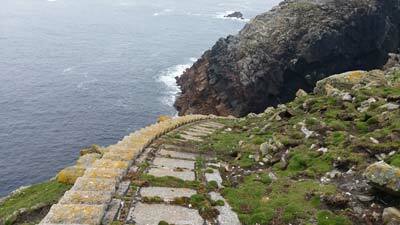 The old tramway leading down to the crane on the West Landing. The area to the right is where Robert Muirhead had stated the box of ropes was kept. Looking up from the tramway at where Robert Muirhead stated that the box of ropes was located (beneath the large stone slightly above the centre of the picture). 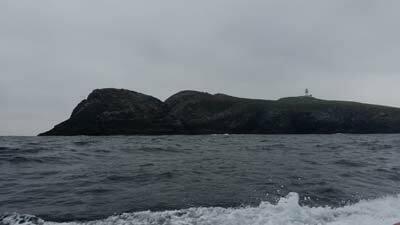 This is 110ft (34m) above sea level and is where Muirhead believed the men were swept away from. Looking down at the stone where Robert Muirhead said the box of ropes was located (beneath the large stone which here is in the centre of the picture). 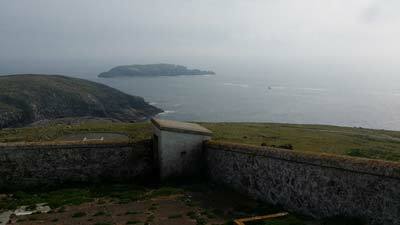 This is 110ft (34xm) above sea level and is where Muirhead believed the men were swept away from. A number of people have commented on this theory including ex-Keepers to say that a giant wave sweeping all the men away is a possibility, but far from being necessarily the only conclusion. They had already had time the previous week to secure the ropes, which was the supposed reason for going down to the West Landing area. Even if they had gone down to the west landing that day then why did they leave it so late in the day when most Lighthouse keepers would tell you that jobs like this are usually done in the morning? The daylight would have been fading as well as it was mid-December. Leading on from item 2, again why did they leave a trip to the West Landing so late in the day as the weather was getting worse, not better? It built up from the morning throughout the day until the early evening that day and then started to lessen in strength. James Ducat had 22 years of experience of lighthouse keeping to call on. Would he have jeopardised his life and that of the others to walk down to a landing that was being hammered by winds and 30ft to 40ft waves which were building up to just below storm force? Walter Aldebert's theory of a man being swept away by a freak wave is fairly credible but his theory took no account of the weather that day. In his report Aldebert suggests that "the wind lessens" - it didn't, it was getting worse from that morning right up until 6/7pm when it was just below storm force. Aldebert asks us to believe that one man either fell in or was swept away by a freak wave and then asks us to believe that another one then came along and swept the other two away as well. The first comments from Captain Harvie and that of Robert Muirhead concerned the wind rather than the waves and appears to have been the first reaction of both men. Muirhead commented that the wind would have been going up the slope but this assumes that the men were down in the area of the West Landing or the cliffs on top of it. Muirhead says there would have been time to throw themselves down flat on the ground before reaching the cliffs on the other side. This, of course, is only if they were hit by the wind at the West Landing area at the top of the cliff there. If the wind was that bad, they would have had a hard time approaching it from the direction of the lighthouse itself in any event. However, if Ducat and Marshall had donned their weatherproof gear to walk out into the courtyard area to investigate, for instance, the banging door of where the winch room was, a powerful wind would be funnelled between the side of the lighthouse and the outer wall and the men could have been picked up and taken over the wall and straight over the nearby cliff on the other side of the wall. The wind would have no obstructions coming up from the West Landing into the area in front of the winch house as the wall surrounding the station is lower at the front than the level of the ground in front of the winch house. 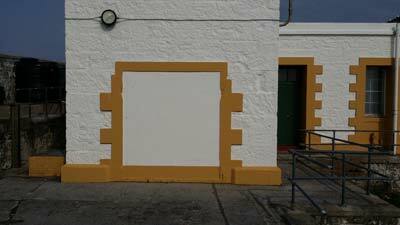 The area in front of the winch house doors (now bricked up) were totally open to the wind and the wall behind the photographer would have acted as a partial wind tunnel. The distance from the entrance into the lighthouse (green door in the picture) to this area is only a matter of about 15 feet and once turning the corner, a keeper would be exposed to the full force of the wind. 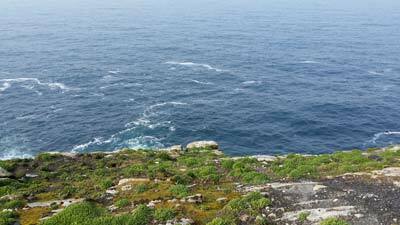 The cliff edge seen here is only a matter of feet from the lighthouse wall. 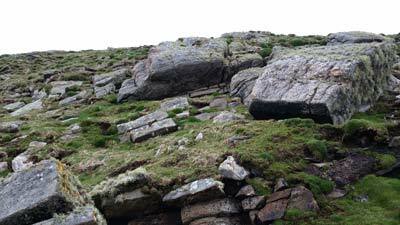 If the wind had carried them over the wall, there was only a very short distance to the edge of the cliff and a sheer drop of almost 300 feet to the sea and rocks below. After a while, Donald Macarthur may have been wondering what had happened to his colleagues and as he was not part of the work detail so to speak (ie Ducat and Marshall were expecting to be out in the bad weather for a while hence the waterproof gear), he decided to quickly look out and see what was taking them so long. 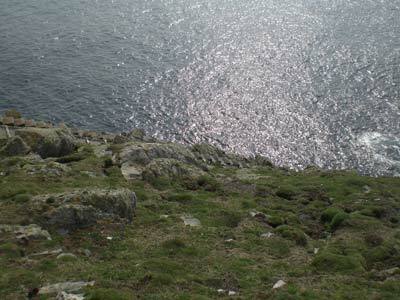 The distance from the main door to the area in front of the winch room is only 12 to 15 steps so he may have walked out expecting to quickly check and see what was happening without putting on his "wearing coat" and once he turned the corner, he too was caught by the wind and carried away over the wall and cliff. Whilst this may seem a fanciful explanation, the power of the wind at these isolated lighthouses has to be experienced to be believed. 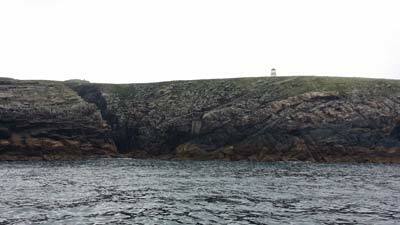 A number of lighthouses have their own peculiar wind vortex characteristics, two examples being Barra Head and Muckle Flugga. Captain Harvie was aware of this possibility right away. 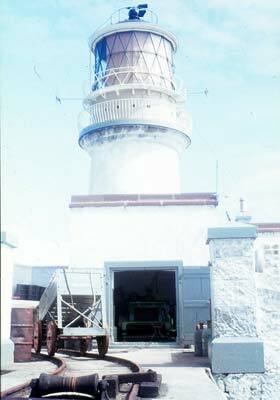 As an example, former NLB Light keeper Alistair Henderson (who weighed 16 Stones - 102Kgs) was once carrying a fridge between the Lighthouse and station buildings at Rubh'Re when the wind lifted him, while he was holding the fridge, off his feet and blew him over and landed several feet away. As a theory, the wind cannot be discounted for possibly being responsible for the loss off the men. Robert Muirhead is owed a lot more than is realised in regard to establishing a worthwhile career structure and terms and conditions of employment for Scottish Lightkeepers and their families. The infrastructure that he made major efforts to set up, remained very largely the same until double-manning of the Rocks and the introduction of Local Assistant Lightkeepers in the early 1970s. He arrived on the scene at an important time; the building of the major lighthouses was drawing to a close and of course the Flannans was the last link in the chain around the Scottish coast. Hitherto, responsibility for these Stations, the men who manned them, and the families who lived in NLB provided houses had been the responsibility of the Engineers, but someone was far-sighted enough to realise that they did not have the same level of interest in the welfare of their employees and their dependents that was going to prove necessary to man their isolated establishments that they had lately made so much effort to construct. It is entirely possible that the Flannans was the first Station to come under the responsibility of the Superintendent that could very well explain Muirhead's particular interest in it. It would also explain his personal efforts to secure, in his opinion, the best crew to initially commission it under Ducat, who it must be said, had grave misgivings about accepting his posting there. Anecdotally, Robert Muirhead is believed to have favoured locating the Flannans Shore Station in Stromness, alongside that of Sule Skerry, but it is said that he was over-ruled by the DA Stevenson and the engineers who insisted on Breasclete. DA Stevenson had earlier also favoured Stromness. Muirhead did spend what seemed to be an inordinate amount of time on aspects of the Flannans Station though. There is nothing on record that he expended such similar efforts at other lighthouses. It was quite unprecedented for the Superintendent to travel to a station such as the Flannans in December and totally unheard of for his wife to accompany him. 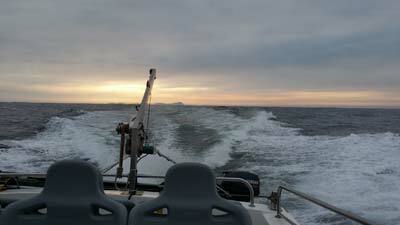 Anyone who has travelled to the Flannan Islands, even in the present day will know the difficulty of landing there. In the middle of winter in 1900, it would have been even more so, particularly for Mrs Muirhead who would have been wearing the Victorian style of dressing. A visit on this date would have been no accident on Muirhead's part. It would have given him. He would have known that he would have private and uninterrupted access to people ashore such as Moore and Ross and the presence of his wife would have been in the capacity of giving pastoral care to the wives and families of the Lightkeepers in Breasclete. The issues with Donald Macarthur necessitating a trip by Muirhead may have been due to the fact that Macarthur had spent most of October and nearly the whole month of November plus most of the early part of December on Eilean Mor. It was accepted that the Occasional Keepers had to cover for sickness but Macarthur and presumably everyone else had no idea how long he (Macarthur) was going to have to cover for Ross as weeks seemed to be rolling into months on the rock. Macarthur lived with his family on Breasclete and had his own croft, so he was not as dependent as the others on the NLB to provide him with housing. It is not beyond the bounds of possibility that MacArthur had presented the Board with an ultimatum that they either resolve his 'situation', or he was going to pack it in. That scenario would certainly have brought the NLB Superintendent out of Edinburgh in December. Had there been an ultimatum, the NLB would not have responded well to it and rather than appease him, they would have decided to sack him without question. In those days the NLB would have been a stern taskmaster and would not have brooked any nonsense. Whilst he may not have been dismissed as such, he merely would never have been recalled to duty. However with the continued absence of Ross and with no-one else being available, MacArthur would undoubtedly have been told that he faced a further two weeks on the Rock until Moore's return from leave on the 21st December. In fairness to Macarthur, he would have had a croft to attend to as well. The whole concept of Occasional Lightkeepers was fairly new at this time and possibly nobody had given any thought to what the position was in times of an Occasional being required to cover for an extended and open ended period of time. It is quite likely that the problems had started back in October and it is possible that some correspondence between Muirhead and Ducat had taken place before Muirhead's arrival on 7th December. 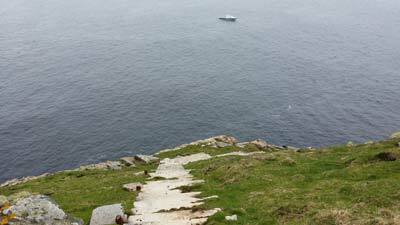 The steepness of the cliff area and the steps to the West Landing can easily be seen in this picture. To lose your balance or be blown by a strong wind would take a person straight over. 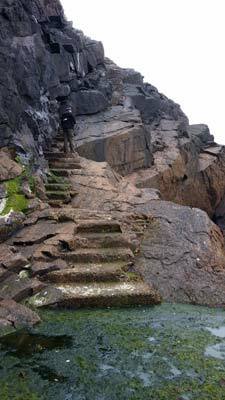 This picture of the West Landing stage shows how the sea has partially washed away the steps which can be treacherous with the seaweed underfoot. Some, but not all, of the Lighthouses Lens apparatus floated in a bath of mercury rather than being placed on rollers. 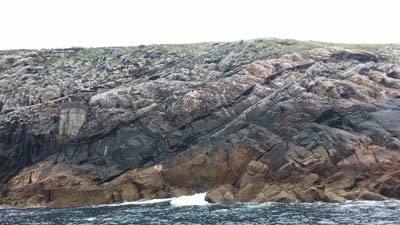 The Eilean Mor Station was one which used a bath of mercury. Being exposed to mercury can have different effects on people. Some can be badly affected by it while others appear to not have any untoward effects at all. The expression "Mad as a hatter" comes from milliners who went mad working with mercury in the course of their hatmaking. A theory is that one of the Keepers may have been affected by the mercury vapour over a period of time and driven mad eventually by this, may have run out of the lighthouse with the other two following him to try and calm him down and bring him back to safety. Under the conditions that afternoon of high winds and heavy seas, it is possible that the keeper affected by the mercury may have gone over a cliff with the other two trying to rescue him and all perished. 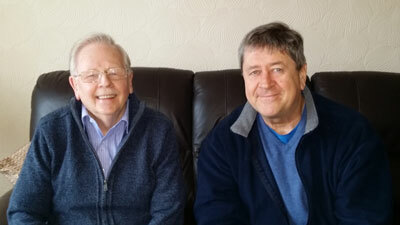 Norrie Muir and Keith McCloskey, South Queensferry, Dec 2014. 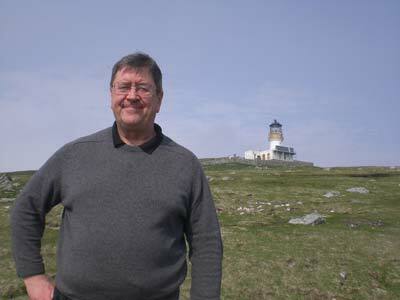 Norrie Muir is one of only two surviving Lightkeepers who have served at the Flannans Lighthouse. 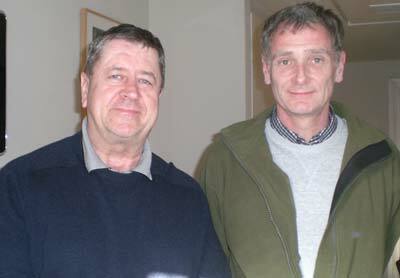 (Left to Right) Keith McCloskey and Steven Gibbons taken in Edinburgh April 2014. Steven is a descendant of Thomas Marshall. 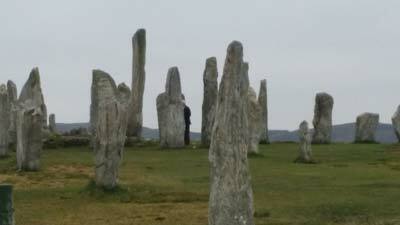 The depth of spirituality in the whole area is exemplified by the ancient Callanish Stones monument. These are perhaps the best example in Lewis of these types of ancient monuments of which many are to be found. The suggestion that Eilean Mor was a place in pre-Christian times where the dead were taken to and placed on pyres can easily be imagined. With the disappearance of the three men, the island has an overwhelming sense of melancholy.